The first week of BH Redesign Go live ended with a training on how to enter your claims on the MITS portal. Good training and they will be posting the video and once they do, I will share it. I talk to agencies every day that were taken off guard by the changes. Many state their software isn’t ready, many don’t fully understand the rules that support these changes. And almost all, have a lack of full understanding about the complexity of these changes. As an agency providing behavioral health in Ohio, you do have options. There is a contingency plan offered IF you do not feel you are ready and MITS portal claim entry is not an option. Realistically, if you have significant claim volume, it will be difficult to keep up and get the correct reimbursement through MITS portal claim entry. See below for information on how the contingency plan works. Ohio Medicaid has developed a contingency plan to assist community behavioral health provider agencies that need some extra time beyond Jan. 1, 2018, to update their electronic billing systems to submit EDI transactions and transition to the new coding requirements. NOTE: Providers may still use the MITS portal to submit Medicaid claims in lieu of EDI submission. This would alleviate the need to enter into a contingency agreement with ODM (see previous January 3rd MITS Bits on MITS Portal training occurring today for BH Providers). Medicaid, using state funds, will advance a monthly payment for January, February, March, and April 2018 equal to 54.6 percent of the provider’s average monthly Medicaid reimbursement in calendar year 2016. At any point, a provider may connect to MITS and bill for services provided after Jan. 1, 2018. Medicaid will recover the advance payment by offsetting claims paid once a provider begins submitting claims successfully or between May 1 and June 30, 2018, whichever is earlier. Providers intending to utilize this option must return a signed copy of the BH Advanced Payment Agreement in PDF format to BH-Enroll@medicaid.ohio.gov by 5:00pm on Jan. 16, 2018. Providers can access the BH Advanced Payment Agreement HERE (it is also located on the BH website homepage). If your agency is enrolled as both provider types 84 and 95, please sign and submit a separate agreement for each 84 and 95 line of business and include your corresponding 7-digit Medicaid billing ID. Each line of business will receive an advanced payment separately. Advanced payment agreements are intended only for behavioral health providers not ready to submit claims for dates of service beginning Jan. 1, 2018. Remember that the MITS portal is still open 24/7 for the submission of claims for behavioral health services rendered to Medicaid clients not enrolled with a MyCare Plan. These agreements are intended only for BH providers with a claims history in CY 2016. Advanced payment agreements will not be approved for providers new to Medicaid billing. ODM will inform the provider of their average monthly payment amount via email prior to first payment. ODM will make the monthly advanced payment for January and February together. The payments for March and April will be delivered in the early portions of each month. ODM will monitor BH claims submitted to MITS system for dates of service on or after Jan. 1, 2018. For claims submitted after Jan. 16, 2018, to MITS either electronically or via the MITS portal for dates of service on or after Jan. 1, 2018, ODM will terminate their advanced payment agreement. BHBS does offer accurate MITS portal claim entry with a 100% guaranteed paid claim assurance on all fully documented services that are reimbursable. Contact us for more info. We also offer training on how to enter them yourselves as well as implementation support for your software. We know Ohio Behavioral Health billing and will work with you to get yours up and functional. Last week, Ohio Council released a “Rapid Response” contact information sheet. Thanks, as always, to Council for this info. If your agency wants to stay in the know, become a member of Ohio Council. They support, advocate and literally stand up for their members when otherwise we may not be able to voice our concerns. 1. Check your client’s Medicaid eligibility PRIOR to submitting your first file. 2. 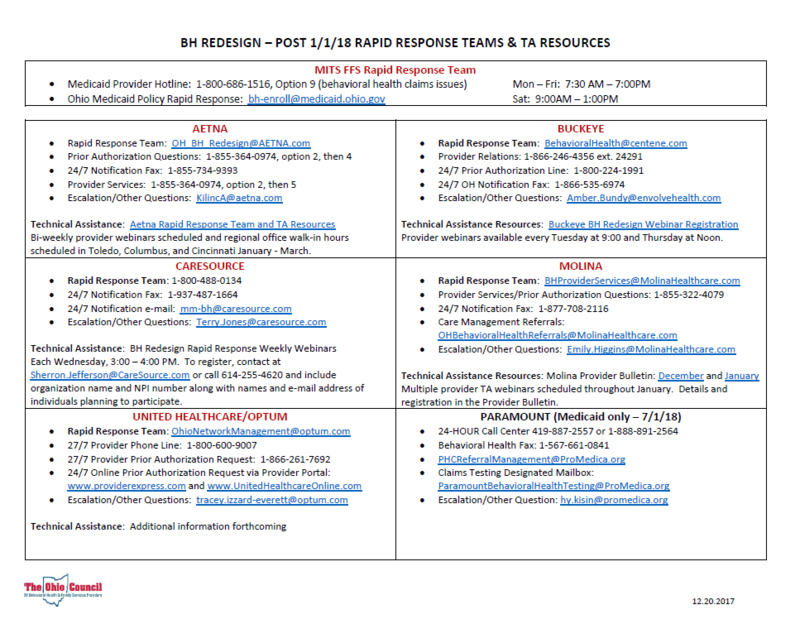 Check your 277 Claims Response file. Review for any denials. Be sure to look at the claim level and line level denials. Together, they tell you how to understand the denial. 3. When your 835 comes back, compare it to your original billing file and 277 file. Ensure that you are FULLY paid for each service. For assistance on reading your 837 billing file, 277 claims response file or 835 payment file, contact EMS Healthcare Informatics for a tool that will change how you bill today.